The 2007 Honda Rincon 4X4 for Sale is an automatic 2007 Honda TRX680 Rincon 4x4 with just with 3025 miles on it. It's priced right to sell; posted with perfect timing for the upcoming season. Check the list below to see the Rincon's impressive specs. GoGoCycles encourages our visitors to take some time to write a review of the 2008 HONDA RINCON for Sale to make the biker community aware of any problems that are common to this 4X4 or to point out its positive features and help potential buyers make informed decisions. 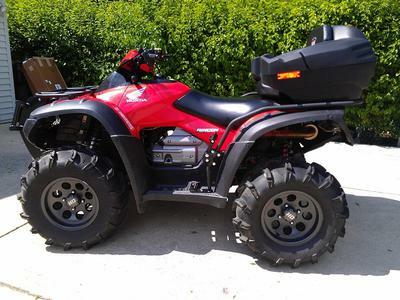 It's located near Boise Idaho ID and my asking price for the red Honda Rincon 4x4 is $4195 and to get more information and photos on the used Honda ATV for sale, please call (no e-mail) at (208) 468-07seven5 (and don't forget to mention that you found this ad on GoGoCycles Used Honda ATV for Sale gogocycles.com).